Includes both Hummingbirds and Nocturnal Wildlife! This is one of our most popular shoots. WE SUPPLY THE FLASH EQUIPMENT, nature supplies the birds! As you'll see, besides hummers, there are a variety of other birds and animals to film as well. and ALL OF THE FLASH EQUIPMENT, LIGHT STANDS, SLAVE UNITS, AND METERS NECESSARY FOR DOING THIS SHOOT! This Shoot also includes instruction on how to set up a hummingbird shoot of your own; as well as how to clone and use Masks in Photoshop for the most effective hummingbird compositions! you'll need to decide upon this tour. It will take a few minutes to read. For even more information, read the our previous years' trip reports. 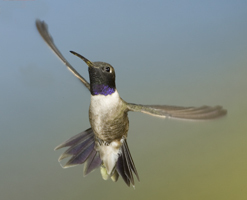 The Mountains of southern and southeastern Arizona are home to the greatest variety of hummingbirds in North America. 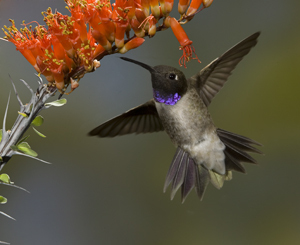 From our base at the world-famous Santa Rita Lodge in Madera Canyon, nestled in the rugged Santa Rita Mountains, we'll concentrate upon photographing several species of hummingbirds at our feeders. In a typical year we film three or four different species, including the brilliant and common Broad-billed, the huge Magnificent, and the less frequently seen Black-chinned, Anna's, Costa's, and occasional Broadtailed, Rufous, or Calliope. Our photographers will be shooting at our flash setups, featuring a variety of flash equipment. You DO NOT need to know or understand electronic flash, and you DO NOT need to have your own flash equipment along! Everything is setup, and ready for you to start filming these incredibly colorful and exciting birds. You'll be filming at a variety of electronic flash and natural light setups. Each participant is rotated on a scheduled route through all our setups, insuring the likelihood of capturing activity at each setup during the course of your shoot. It must be remembered that these are wild birds, and patience is required for success with some species. However, by having time at all the feeders over several days, most everyone enjoys success at each setup. Of course, you're also free to trade off, pass on, or substitute with your fellow participants at any feeder, depending upon what's "hot" and what's available. Let me stress the importance of this: If you were limited to your own flash system at your own setup, you would be at the mercy of the birds visiting only your feeder. Sometimes, as you'll see, birds prefer one feeder over another and ignore one setup for hours or days at a time. Imagine if that was your feeder! By rotating people through all the flash setups, you are insured to 'hit' great action through the course of the shoot, and usually every single day. That's simply not possible if you are limited to one personal flash setup. All you'll need is your telephoto lenses, and either a camera with a PC socket or a flash with a PC terminal, or a small off-camera flash that can trip my Slave units. The rest is prepared for you -- all you need to do is focus and shoot! Our Natural Light Feeder setup is 'hot' from the moment the sun rounds the mountain crest until around 5PM, providing great practice, and wonderful shooting, during both early morning and late afternoon, when the hummingbird's resplendent iridescence shines in the low, angular light. In 1997 we had three species regularly visiting these feeders, with another two teasing us on occasion. Natural light songbirds .... We'll have a variety of 'stations' setup for feeding a variety of songbirds common around the lodge. 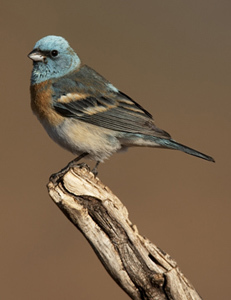 These include Mexican or Gray-breasted Jays, harlequin-colored Acorn Woodpeckers, Bridled Titmice, White-breasted Nuthatches, Yellow-eyed Juncos, Scott's Orioles, black-headed grosbeaks, pine siskins, and the ubiquitous House Finch. We'll also be setting up two or more 'insect feeders,' where insectivorous birds that avoid seed feeders may gather to eat easy nutritious mealworm snacks. It's possible we'll attract the vividly colored Painted Redstart, as well as Black Phoebes, Flycatchaters, and Kinglets. Our 'Water Set' - Virtually right in front of your lodging we set up a natural light water set that allows you to shoot virtually water-level images of birds and mammals drinking at our water set. In 2006 we had Western gray squirrels, black-headed grosbeaks, acorn and Arizona woodpeckers, lesser goldfinches, pine siskins, house finches, bridled titmice, white-breasted nuthatches, and a few other species of songbird, all drinking within easy range of your lenses. Like all of our natural light sets, the water set is available all of the time, although it is particularly productive in the late afternoon. The Pond - My friend, Bill Forbes, has set up a terrific photography location on his property just a half hour away in the neighboring canyon. Called 'The Pond,' the location features an 8x15 foot water hole with three permanent blinds and two portable blinds that can be moved where ever a photographer wishes. In 2006, during the course of our stay, our photographers filmed at least THIRTY different species of birds, and virtually everyone can film at least FIFTEEN species in a typical morning shoot. Bill charges a fee for this unique shooting locale, but we've built a session at The Pond as part of your shoot! Only two photographers shoot per morning (or all day, if they wish), and all props and bait stations are movable, so that you can control the working distance and the background you desire. This is a terrific addition to our offering, and you'll love your special time at The Pond. Flash Setups with Birds ... We'll also be trying to attract the smallest owl in North America, the tiny Elf Owl, to our insect feeders. If this works, it may be possible to film this owl perched above our insect baits. Additionally, we'll try do one or more flash setups of insect-eating birds, like the Bridled Titmouse, Redstart, and others. Nocturnal Mammals ... 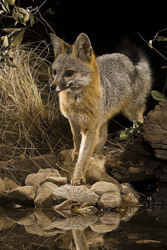 The Madera Canyon area is home to a variety of interesting night-active mammals. These include Ringtailed Cats, Raccoons, Skunks, Opossums, Kangaroo Rats, White-throated Woodrats, and Whitetail Deer. By simply walking the canyon's trails a few minutes after sunset, you're likely to see one or more of these species. Some, unaccustomed to people, are extremely approachable. We also have flash setups at food sources or water lures for nocturnal shooting. One evening you may have the option to film Bannertailed Kangaroo Rats near their dens in the desert. These incredibly cute, gerbil-like rodents are easy to film with a flash setup, provided the photographer is patient, and quiet! It's a fun, unique shoot! Because of hunta virus, we cannot take people down to the kangaroos as part of an organized shoot. However, if you wish, we will show you where the kangaroo rat burrows are, should you still wish to attempt photographing them. It's possible , but unlikely, that nectar-feeding Long-nosed Bats will visit our feeders after dark. If they do, we'll do a remote flash setup that's almost guaranteed to capture a bat in flight -- if they visit! Whitetailed Deer are very common, and can be seen at almost any time of day. At our water baits near the lodge, we'll try to capture these animals with flash. Insects and Spiders ... Our natural light flower/hummingbird feeders often attract spectacular bees, wasps, and butterflies. In the desert, there's scorpions, and unique green Lynx spiders. Reptiles and Amphibians ... The area around our lodge is home to several small, harmless herptile species that make great shots. Side-blotched, Striped Plateau, and Clark's Spiny Lizards sun themselves along the paths and trails. In the desert, we might find Horned and Earless Lizards. For macro enthusiasts, these subjects are a rewarding challenge! Along the water's edge you might find cryptically colored, but extremely cute, Canyon Treefrogs huddled on the boulders. Scenics, Plants, Night Scapes .... The stream that 'usually' runs adjacent our Lodge affords wonderful riparian river habitat images. Arizona Sycamores, Alligator Juniper Trees, Cacti, Phlox, and other plants are common and atrractive. Some cacti are typically in bloom in sheltered areas of the canyon, and their blooms are spectacular! The mountain landscapes, especially at the desert's edge at dusk, are wonderful. And, for those willing to stay up late, you'll have at least one chance (weather permitting) to film Star Trails framed by the rugged Santa Rita's. The Arizona-Sonoran Desert Museum ... For those staying a few days after our shoot, we'll provide our tips and shooting guide to this wonderful, photo-friendly zoo. The Hummingbird Aviary is worth the visit alone, but the new Roadrunner exhibit, as well as the Bird Aviary, Prairie Dogs, Lizard enclosure, and wild, but very tame Cactus Wrens make for a great morning (or several) shoot. To further accommodate our participants, we'll be arranging the hummingbird flash shooting rotation so that a few participants will have the chance, one morning, to visit the museum and get in a great morning shoot before returning for the PM hummingbird rotation. Two people will have this chance per day, once per session. If you elect to stay around the lodge there are all the other subjects we just listed -- the natural light setups, the insect feeders, the canyon trails, the natural light bird setups, etc. However, by allotting some time, you will not have to stay on in Arizona at the conclusion of the photo shoot. Please note that we will not be providing transportation to the Museum. That's generally not an issue since most participants drive to the site via personal or rented cars. Photo Courses, in either Pennsylvania or Arizona next summer! 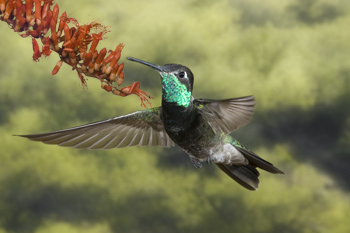 Food and Lodging: The price of the shoot includes five nights lodging at the Santa Rita Lodge, world-famous among birders for its hummingbird and birding potential. Near gourmet lunches and dinners are included, but breakfasts are not. Participants will have an opportunity to buy breakfast items at the supermarket in nearby Green Valley. Lodging is based upon single occupancy. Non-photographic spouses are welcome, and will be charged only for food and transportation costs. Slide Shows and/or Evaluation: Participants are encouraged to bring along a portfolio of images for DIGITAL projection. These can be on a CD or DVD, or mounted in your own laptop computer. This is a favorite activity enjoyed by most as simply a slide-sharing session, although comments, criticism, or helpful tips will be offered if desired. Should you wish, you can bring along your own slide carousel with your slides premounted. We WILL NOT have a slide projector along, however we will show your slides PROVIDED that you bring along the projector. Flash Setups and Rotation: Participants will be assured an equal amount of time at the many setups provided. However, you're welcome to 'sit out' a session to pursue personal projects. You should have a minimum of fifteen hours scheduled time with the high speed flash systems, insuring razor-sharp images. There's always 'free time' when participants are not scheduled where, if I'm not working on setups or plans, participants are welcome to shoot. Additionally, you're invited to bring along your own flash systems, if you so desire, to set up a hummer station in front of your cabin. A warning, though: A few people have brought flash systems along but no one has ever, EVER, set up their own system. That's because our setups provide enough shooting, the feeders are established, the birds are coming in, and the extra work simply wasn't worth it! Equipment Required: The shoot is designed for digital SLR equipment. A zoom lens covering these ranges: 70-200, 70-300, 80-400, 100-400, 18-200, or 28-300 works very well, or a fixed 200mm macro lens or a telephoto of 300mm or 400 is best for most setups. For the natural light setups and photographing at 'The Pond' you'll enjoy best results with a 300mm and 1.4X, a 400mm, or a 500mm lens. You may wish to bring a 200mm macro lens, or a 70mm- or 80-200mm zoom with extension tubes for close ups of hummingbirds at one of the feeders. You'll have plenty of room to bring whatever gear you might need. We will provide details on all suggested gear to registered participants.We strongly recommend that you bring along one TTL flash of our own. This can be useful for tripping our flashes in some of the hummer sets and nocturnal mammal setups (via slaves), and for TTL fill-flash for the natural light bird feeders. If you wish to shoot the mammal setups, you may need additional accessories like long cable releases or remote trippers. Patience: As I said earlier, these are wild birds. On occasion, photographers have spent an entire 1 and 1/2 hour session and exposed only five frames. Conversely, the same feeder, days later, yielded scores of shots in the same time period. Some birds, like the Magnificent, are wary, and require either using a remote release, or being behind the camera when the bird suddenly appears at the feeder. Others are extremely tolerant of motion -- last year one participant shot headshots of feeding hummers with his macro! 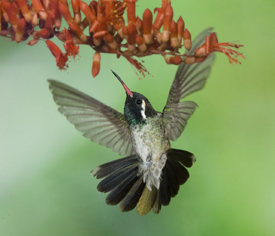 Although you'll probably only need one 'knock out' shot of a hummer, most participants expose several hundred frames of hummingbirds, and perhaps an equal number of frames of the songbirds, mammals, and other subjects that are available. 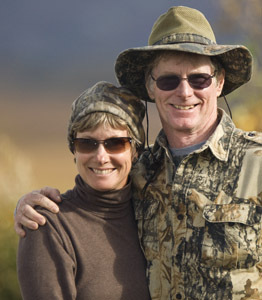 My wife Mary Ann and I strive to provide the most comfortable, enjoyable, and thorough shooting experience we think you'll ever experience. Both Mary and I are photographers, and I'd hope you've seen our credits. Our work regularly appears in National Wildlife, Ranger Rick, Natural History, Living Bird, Birder's World, Wildlife Conservation, and most nature/wildlife calendars. I hope you've seen some of our books. To date I've written five, A Practical Guide to Photographing American Wildlife; The Wildlife Photographer's Field Manual; The Complete Guide to Wildlife Photography; Designing Wildlife Photographs; and Photographing on Safari. Mary's written ten children's books, including Woodpeckers; Leopards; Grizzly Bears; Cobras; Boas; Pythons; Rattlesnakes; Garter Snakes; and Flying Squirrels, and an adult book on the Amish. Both Mary and I are at work on several new book projects. Additionally, in 1994 Mary won two first place finishes in the BBC Wildlife Photographer of the Year Competition, in Bird Behavior and with Endangered Species. More importantly, as photography instructors we are dedicated to providing you with the help, instruction, and information you'll need to have a most successful shoot. We're confident you'll enjoy this experience (many participants do the trip each year! ), and we hope that this shoot will be just one of the many we will share together. In fact, many of our offerings are filled with repeaters, and many of our extensive trips are not advertised for this reason. Although we'll have several flash systems setup and ready to go, the unforeseen can happen. We've rarely had rain, and it's not expected this time of year, but it could happen. One or more flash systems could break down, or you could be plagued with bad luck and never have a bird at your feeder when you're there -- though that's never happened! The natural light setups simply require that you are there, but YOU must have the energy and ambition to capitalize on these opportunities. Great images can require shooting a lot of film, and having patience, so bring both with you for this shoot! The Hummingbird Shoot is LIMITED to SIX photographing participants. Non-photographing spouses are welcome, and a fee is assessed for food, operating expenses, and insurance.